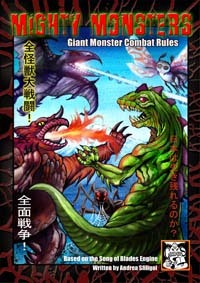 Mighty Monsters recreates the giant monster battles seen in Kaiju Eiga, the Japanese giant monster movie genre. If you are not familiar with Kaiju, we encourage you to watch the latest DVDs produced by Toho company or Daiei (available in subtitled or dubbed editions). Both the Godzilla and the Gamera film series represent the state of the art in this specific genre. Some interesting variations are also coming out of Korea and other Asian countries. In the game, every player controls one or more monsters fighting against each other and turning the world to rubble. The background is our own world, as it exists today or, if you prefer a retro feel, as it was in the classic Japanese monster movies of the seventies. The only important difference is that giant monsters, much bigger than the largest dinosaur, populate the Earth. Some of them are benevolent earth guardians, protecting the planet from mankind’s folly and invaders from outer space, others are unstoppable forces of nature bent on global destruction. These monsters fight each other, destroying everything in their wake. Who will prevail? Play a game of Mighty Monsters to find out!